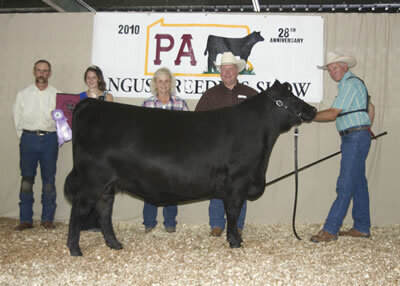 Judge: Phil Trowbridge, Ghent, N.Y.
Freys KJF Arkpride P48-T105 won grand champion female at the 2010 Pennsylvania Breeders Angus Show, June 20 in Huntingdon, Pa. Katrina Frey, Quarryville, Pa., owns the September 2008 daughter of Connealy Danny Boy. She first claimed senior champion. 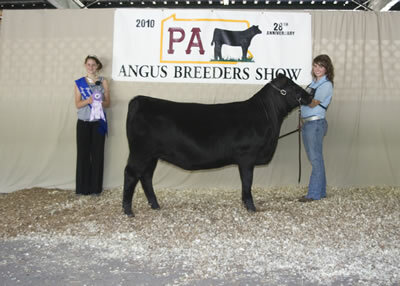 CRW Miss Tequila 7020 of JDH won reserve grand champion female at the 2010 Pennsylvania Breeders Angus Show, June 20 in Huntingdon, Pa. J D H Cattle Company, Dover, Pa., and Charles Weaver, Finksburg, Md., own the September 2008 daughter of Cherry Knoll Pole Setter. She first won reserve senior champion. 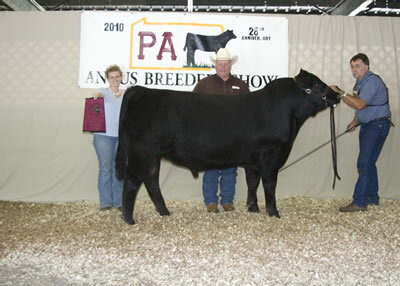 Rains Sunlight Halo Lo878 won junior champion heifer at the 2010 Pennsylvania Breeders Angus Show, June 20 in Huntingdon, Pa. Dale Rains, Mercer, Pa., owns the winning heifer. 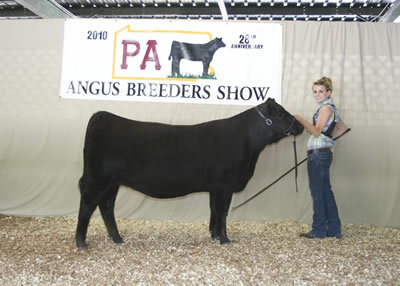 Freys Cheryknol Arkpride U57 won reserve junior champion heifer at the 2010 Pennsylvania Breeders Angus Show, June 20 in Huntingdon, Pa. Katrina Frey, Quarryville, Pa., owns the winning heifer. 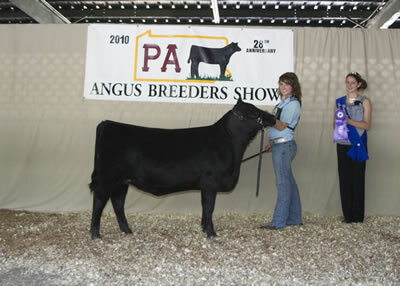 B C A Scaara Belle 933 won intermediate champion heifer at the 2010 Pennsylvania Breeders Angus Show, June 20 in Huntingdon, Pa. Hannah Grim, East Berlin, Pa., owns the winning heifer. 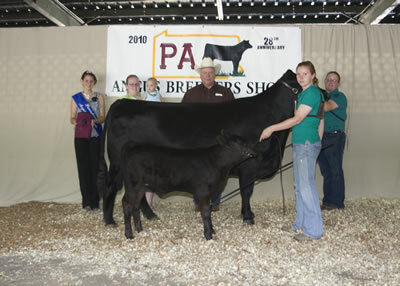 M V A Edella Va Kara won reserve intermediate champion heifer at the 2010 Pennsylvania Breeders Angus Show, June 20 in Huntingdon, Pa. Valerie Coleman, Shirleysburg, Pa., owns the winning heifer. 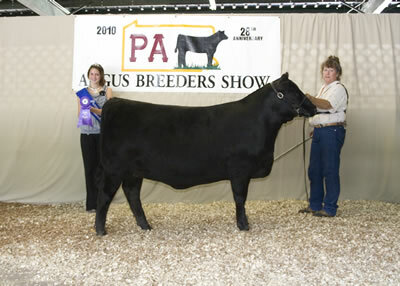 Freys kjf arkpride k32 u112 won senior heifer calf champion at the 2010 Pennsylvania Breeders Angus Show, June 20 in Huntingdon, Pa. Katrina Frey, Quarryville, Pa., owns the winning heifer. 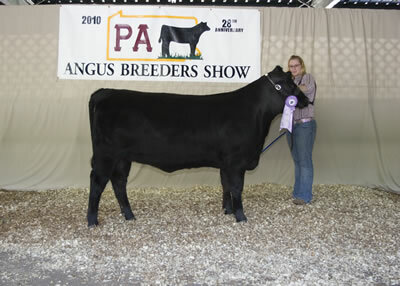 Freys kjf arkpride m35 u108 won reserve senior heifer calf champion at the 2010 Pennsylvania Breeders Angus Show, June 20 in Huntingdon, Pa. Katrina Frey, Quarryville, Pa., owns the winning heifer. 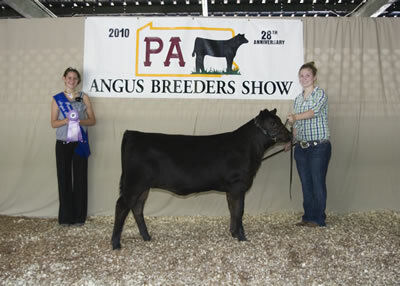 U H A Miss ME 722 010 won won heifer calf champion at the 2010 Pennsylvania Breeders Angus Show, June 20 in Huntingdon, Pa. Lindsay Upperman, Chambersburg, Pa., owns the winning heifer. 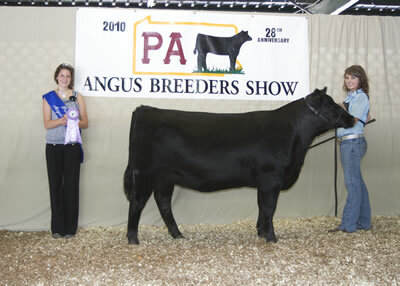 DCC Lass's Lady 0202 won won reserve heifer calf champion at the 2010 Pennsylvania Breeders Angus Show, June 20 in Huntingdon, Pa. Shelby Dean, New Castle, Pa., owns the winning heifer. 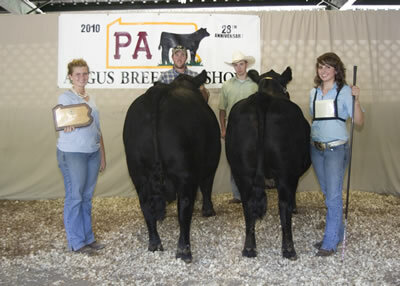 Check Mate won grand champion bull at the 2010 Pennsylvania Breeders Angus Show, June 20 in Huntingdon, Pa. Cherry Knoll Farm Inc., West Grove, Pa., and Katrina Frey, Quarryville, Pa., own the September 2008 son of Connealy Danny Boy. 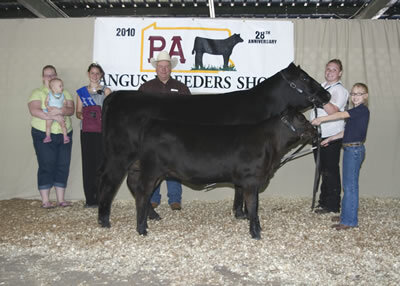 Rains Powerstroke PSNIFPN won reserve grand champion bull at the 2010 Pennsylvania Breeders Angus Show, June 20 in Huntingdon, Pa. Dale Rains, Mercer, Pa., owns the April 2009 son of Sedgwicks Powerstroke 7502. 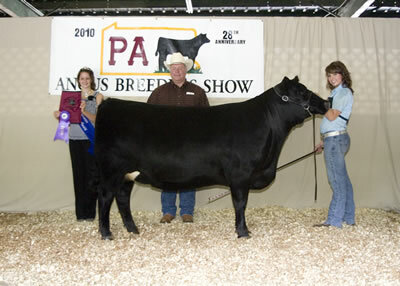 DCC Lasserina 8201 won grand champion cow-calf pair at the 2010 Pennsylvania Breeders Angus Show, June 20 in Huntingdon, Pa. Shelby Dean, New Castle, Pa., owns the February 2008 daughter of DCC Belle's Traveler 406. 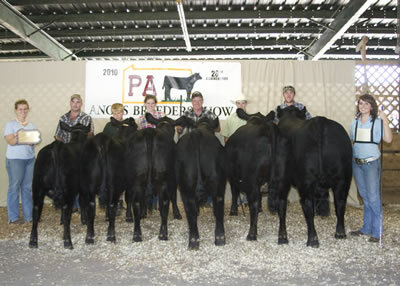 A January 2010 heifer calf sired by P S High Pockets completes the winning pair. 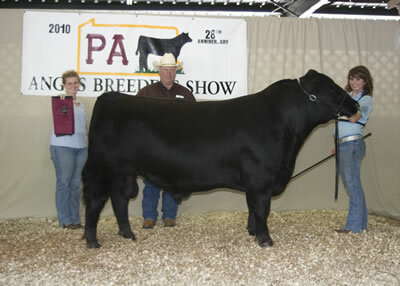 Just Enuff Battalion Frannie won reserve grand champion cow-calf pair at the 2010 Pennsylvania Breeders Angus Show, June 20 in Huntingdon, Pa. Just-Enuff Angus, Bethlehem, Pa., owns the February 2003 daughter of Whitestone Battalion L136. A May 2010 heifer calf sired by S A V Final Answer 0035 is at side. 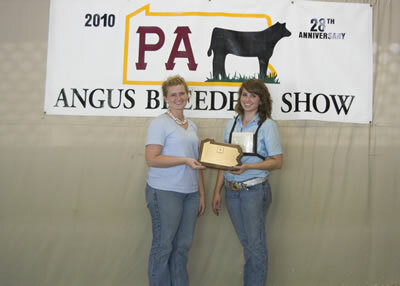 Katrina Frey, Quarryville, Pa., right, was named premier breeder and premier exhibitor at the 2010 Pennsylvania Breeders Angus Show, June 20 in Huntingdon, Pa. Pictured presenting the award is Kate Livingston, Pennsylvania Angus princess. 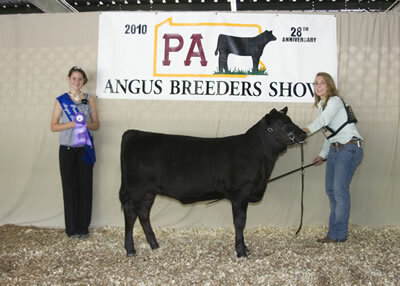 Katrina Frey, Quarryville, Pa., won breeders' best six head at the 2010 Pennsylvania Breeders Angus Show, June 20 in Huntingdon, Pa.
Katrina Frey, Quarryville, Pa., won the Pennsylvania Special Award at the 2010 Pennsylvania Breeders Angus Show, June 20 in Huntingdon, Pa.